Summer is coming, bringing with it a whole slew of Memorial Day Sales as well! As usual, this post will be updated as I learn of new Memorial Day sales — and feel free to send some over my way if you hear about them. Please shop through the links here to support this site, and let me know what you're into/not into! Accompany: Spend more & save more. Up to 30% off sitewide. See my previous post for the various codes and details! *Advice from a Caterpillar: 27% off sitewide with code HAPPY BIRTHDAY (includes the space). Still a whole bunch of Ace & Jig available, but don't forget about the kiddo knick-knacks too. I really love this sheep toy and tassel garland... for kids of all ages, right...? Don't forget that prices are in CAD, so don't get scared off by the numbers! Barneys: Up to 50% off spring items. Prices as marked online. A bunch of Ace & Jig is 30% off and going quickly! Beklina: 20% off everything with code MEMORYSALE20. It's a great time to indulge in some Saki Allovers or Carnival Orchard Pants, among other lovely things. **Couverture & the Garbstore: 25% off with code HOLIDAY25. This one's for the Brits! Now is the perfect time to save on that last pair of Staffords. And don't just look at the Ace — they carry other lovely things like Samuji, Baserange, Steven Alan (perfect chore coat alert! ), and beautiful irregular pearls from WWAKE. Covet & Lou: Extra 20% off their warehouse, with code MEMORIAL17. Through Monday. All sales final. The only Ace I spotted was last season's Anna Dress in Trellis. Fashionkind: a HUGE 40% off clothing with code RTW40 and 30% off accessories with code ACCESSORIES30. Tons of Ace & Jig here, especially from 3rd and 4th drop textiles. Garmentory: Big, HUGE Memorial Day sale from tons of boutiques! Of course, there's lots of Ace & Jig, but I highly recommend just scrolling through all of the sale items to see what deals you can find! Mille: Get 25% off on everything except new arrivals with code MEMORIAL2017. Still a few Ace & Jig pieces remain including the super-cute Park Dress in Crown. Mohawk General Store: 15% off SS17 clothing and shoes with code MEMORIAL15. Life:Curated: 30% off sitewide with code WEEKEND. Lots of Ace & Jig items still remain, so it's a great opportunity to finally go for it! Olive: 20% off with code MEM17. It looks like the Ace & Jig online might be sold out, but you can certainly try calling to see what's in store! Oroboro: 25% off sitewide (with some exclusions) with code MEMORIAL17. Lots of great Ace & Jig to pick from, including Allovers in Major and Archive, and Jo Midis in Dune. Alternative Apparel: 30% off sustainably produced basics with code FRIEND30. Read more about their sustainability practices here. Anaise: 25% off myriad small labels, like Rachel Comey, LOQ, Lauren Manoogian, and MNZ with code APRICOT through May 29. Excludes sale items, books, and home goods. My personal pick is the Eatable of Many Orders bag shown in the main image. Anthropologie: Extra 40% off sale items, 20% off home goods, and free ship over $150 for Anthro members. Prices as marked. Apiece Apart: 20% off select pieces with code RELAX20 through Monday. Bona Drag: Extra 20% off the sale section with code LISTENTOTALKINGHEADS. Find beauties from Brother Vellies, MNZ, No. 6, Baserange, and more! Through Sunday. *Concrete + Water: Up to 40% off spring styles with code HELLOSUMMER. Labels include Ilana Kohn, LOQ, and Osei Duro. The Dreslyn: Up to 40% off on brands like Rachel Comey, Caron Callahan, and Maryam Nassir Zahdeh. Prices as marked. I highly recommend checking out their sale shoes for some great summer sandals! Plus get an extra 15% off your first purchase when you sign up for their mailing list. Eaton Trading Co.: A whopping 40% off with code MEMORIAL17. Some exclusions, but you'll find the likes of Dieppa Restrepo, A.P.C., and Caron Callahan, including that infamous Peach Jacket! FWRD: Up to 50% off tons of things, from brands like Building Block, Marni, and Isabel Marant. I'm totally heart-eyed over these Marni Sandals, myself... Plus get an extra 10% off with code TULIP (some designer exclusions apply). General Store: 20% off shoes with code SUMMERSHOES. Find brands like MNZ, No. 6, and Mari Giudicelli. Through Monday. Kickpleat: 30-50% off items from Atelier Delphine, Apiece Apart, Jil Sander, Samuji, Mari Giudicelli, Jesse Kamm, Horses Atelier... let's just say allllll the good stuff and so much more. Prices as marked. La Garconne: The Spring Sale is on, with up to 50% off all of the good stuff. Hard to go wrong here, if you have the dollars to spare, but there's a Charcoal Capote Coat at a damn good price, and some reasonably-priced and well-made linen basics from Le Vestiaire de Jeanne. *Moorea Seal: Spend more save more. Up to 20% off your entire purchase, including brands like Po-Em, Osborn, and UZI. See details here. Myrtle: 25% off storewide with code MEMDAY17 through Monday. I was thrilled to see that they carry my new favorite mules from Paloma Wool in two colors! Need Supply: New markdowns of 30% off on tons of lovely items, from brands like Creatures of Comfort, A.P.C., Robert Clergerie, and more! My picks are these geometric Robert Clergerie Sandals, burnt orange Creatures of Comfort sandals, Marni kiltie mules, and the best wallet ever. *No. 6: 20% off everything with code CHILL20. Aside from their own shoes and clothing, No. 6 is one of the best and only stockists of Anntian, makers of my favorite avant garde printed pieces! Nordstrom: Nordstrom's Half-Yearly Sale just started! 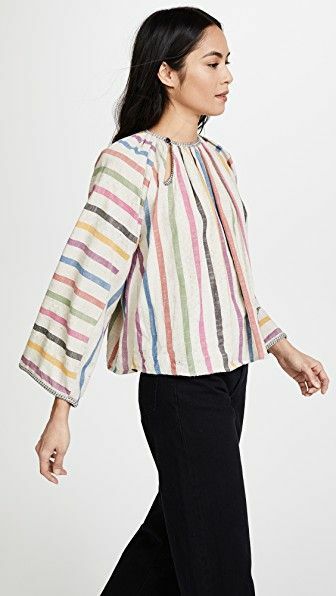 Up to 40% off some amazing labels you may not have known they carried, like Rachel Comey, Creatures of Comfort, Golden Goose, Mociun Jewelry — because Nordstrom is cool now! Proof: Olivia Kim's Pop-Ins and the SPACE. Of a Kind: 25% off select homewares with code HOMERUN through Monday. This Splatter Platter has my heart! Parc: 20% off with code WEEKEND (with some exclusions). 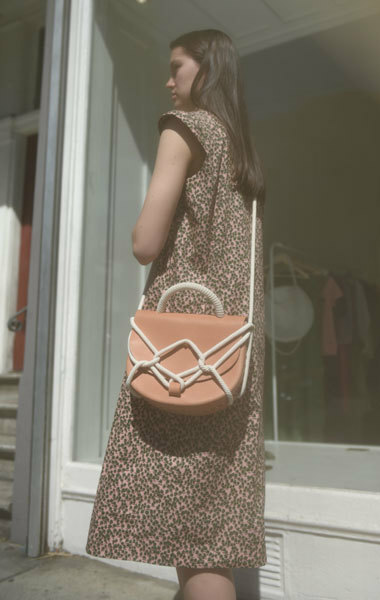 Find the likes of Baggu, Atelier Delphine, and By Far Shoes. *Pas Mal: 20% off with code HAPPYSUMMER. Brands include Anne Thomas, Baserange, and Lauren Manoogian. Rennes: 15% off items in the Memorial Day category with code PEONIES. They're one of the only US shops to carry Ichi Antiquites, one of my most favorite Japanese brands — can't go wrong with that! SSENSE: Up to 50% off labels like Chimala, Isabel Marant, Mari Giudicelli, and more. Prices as marked. Steven Alan: up to 50% off spring items like this peach sweater and this pink cropped shirt (I'm, like, such a millennial!). Prices as marked. Swords-Smith: 20% off sitewide with code MEMORIAL20 through Monday. Highlights: Martiniano glove shoes, and these super-sweet Grey Matters Mildred Egg mules in taupe and black. TenOverSix: has marked some items down by 20%, including Caron Callahan, Jesse Kamm, and MNZ. Plus, use code SHIPFREE for free shipping through Memorial Day. Totokaelo: End of Season Sale starts today! Up to 40% off brands like — Black Crane, Ilana Kohn, and Lauren Manoogian. *Vestige: 25% off clothing and shoes with code SUMMER. Save on brands like Milena Silvano, Atelier Delphine, No. 6, and more!